The train gathered speed and Lapinette ran the numbers. If it shifted to slo mo like before, she knew could make it. But it didn't. The train was a searing white arrow as carriages flashed past. She counted and tensed her left leg. The screech of metal on metal was deafening as brakes engaged. The train slowed. Lapinette caught sight of the Wabbit and he was mouthing something. Lapinette didn't have time. "Looks like jump," she thought. A thump from her leg sent her flying. She stuck like glue to a carriage and the train speeded up. A turbulent wind tore at her frock and she heard a rip. "This means war," she muttered. She wedged her paw into a door and pulled. It gave a little. She could hear voices again. "Do you have tyre iron, Skratch?" "I leave all that sort of thing to you, Wabbit." The door opened slightly but it stuck. Lapinette pushed a leg through and with a massive effort dragged the door. It slid towards her. 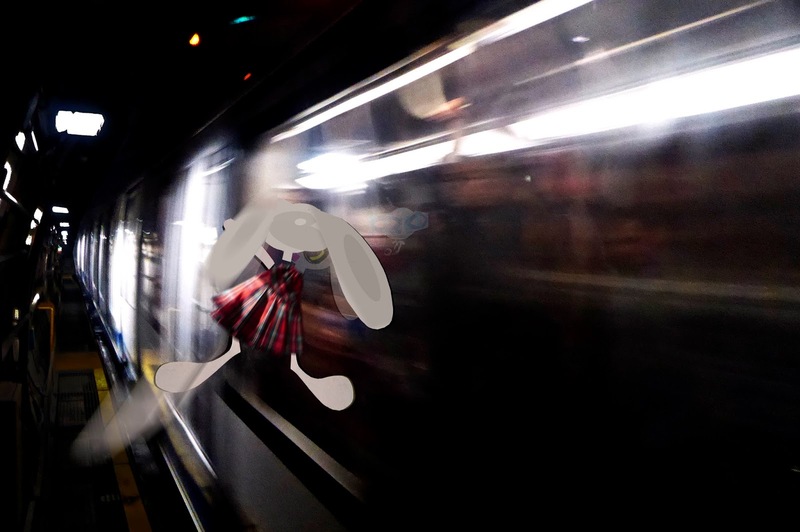 "Simple matter of physics," she thought and she tried to edge along the carriage, but the wind was too much. A paw grabbed at her paw. She stretched and flailed and tried again. The paw suddenly grabbed her ear and pulled. "Aaaaagh!" she yelled. But she was on the floor inside the train and the door was sliding shut. She looked up. "Where's your ticket!" smiled the Wabbit.